my recently retired parents stopped by last night on their way down to florida for a few months, and brought with them about 5 boxes of stuff for me to look over and see if i wanted. one of the items was a kodak brownie 300, 8mm movie projector, that still works! i fired it up this morning as soon as i could, and loaded up one of the movies that was in another box. these films are eerily silent, but show my parents in their younger years, my grandparents when they were still spry, and i believe there are even some films of my brother and i when we were just starting to walk (or else we were drunk) because we kept falling over. the still captured here is my moms dad, seemingly on a trip to the allegheny mts. 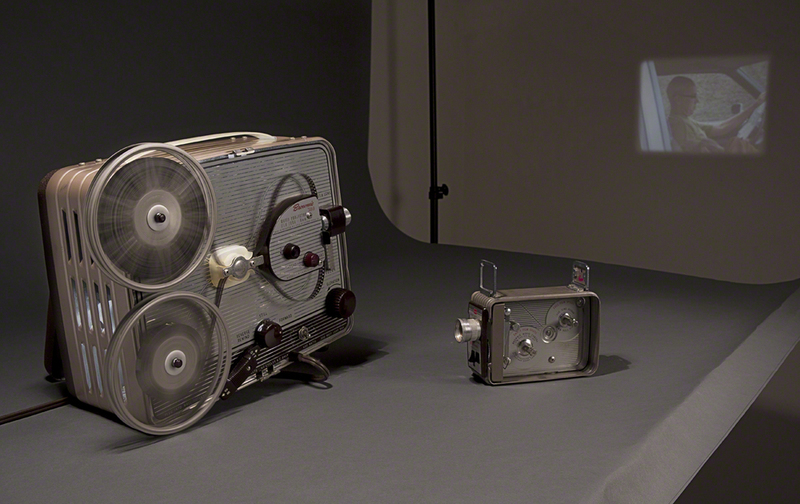 also in the image is the original 8mm camera used to shoot these films. the video to the right was quite a surprise - the first frames are a man on the hood of a car going through a flaming wall. way to capture some awesome moments gramps! if the rest of the boxes are worthy, i may do some still life of their contents.